Canadian GDP, US Consumer confidence, ISM Manufacturing PMI, Rate decision in the Eurozone and important employment figures from the US including the all-important NFO report. These are the major events on Forex calendar. Here is an outlook on the main market-movers ahead. Last week, the Scottish referendum threatening to quit the UK, resulted in a vote against independence pushing the pound higher after sharp drops. Likewise, the US dollar gained momentum as ECB Chairman Mario Draghi, RBA’s Stevens and Chinese policy makers considered using the Fed’s tactics to fight downturn economic trends. Finally the US GDP release showed the economy expanded at an annual rate of 4.6% in the second quarter, better than the 4.2% estimate made a month ago, providing momentum for strong growth the rest of the year. Will the US continue its growth trend? Eurozone Inflation data: Tuesday, 9:00. Euro zone inflation edged up in August 0.3% after posting 0.4% rise in the previous month. The increase was in line with market forecast. The main price increase occurred in rents and car-repair. The Euro area remained in the “danger zone” of below 1% for 11 straight moths. The recent rate cuts and asset purchases are expected to stimulate the economy and boost inflation. ECB next step may involve a more massive bond-buying program. Euro zone inflation is expected to gain 0.3% this time. Canadian GDP: Tuesday, 12:30. Canadian economy expanded 0.3% on a monthly base in June, following a 0.5% gain in May. The reading was better than the 0.2% expansion anticipated by analysts. The increase was driven by an increase in mining and oil and gas extraction offsetting the fall in the manufacturing sector. On a yearly base, GDP edged up 3.1% in June the highest growth rate since September 2011. The Central Bank expects that the economy will expand 2.2% in 2014 and 2.4% in 2015. GDP is forecasted to increase by 0.2% in July. US CB Consumer Confidence: Tuesday, 14:00. US consumer confidence picked up in August, reaching 92.4 from a downwardly revised 90.3 the prior month. The reading was higher than the 89.1 reading projected by analysts and posted the fourth straight rise. Better business conditions and strong job growth boosted consumer’s moral. Consumers also forecasted an inflation rise of 5.5% in the coming 12 months. Consumer confidence is expected to reach 92.2 this time. US ADP Non-Farm Employment Change: Wednesday, 12:15. ADP payroll numbers plunged in August to 204,000, from 212,000 in the previous month. However the ADP figures have proved to be volatile, showing only the general trend of the Non-Farm payrolls coming later that week. Economists expected a stronger release of 218,000. Overall, employment figures remained high, posting the fifth straight month of job gains above 200,000. US job market is expected to expand by 206,000 positions in September. US ISM Manufacturing PMI: Wednesday, 14:00. U.S. manufacturing activity edged up to its highest level in nearly 3-1/2 years in August, rising to 59, after a 57.1 release in July, amid a strong jump of a 3.4% in consumer spending during July, indicating a growth trend in the US economy. Economists expected a reading of 57 points. Private construction, the largest portion of construction spending, rose 1.4%, its highest level since November 2008. U.S. manufacturing is predicted to reach 58.6. Eurozone rate decision: Thursday, 11:45. The European Central Bank cut its benchmark rate to 0.05% in September from 0.15% in August. ECB President Mario Draghi noted the rate cut reached the lower bound following a downturn trend in the Eurozone economy with low inflation, sinking deeper below the ECB’s target of just under 2 %. The ECB also lowered the rate on bank overnight deposits to -0.20%. No change in rates is expected now. US Unemployment Claims: Thursday, 12:30. The number of people filing initial claims for unemployment benefits increased by 12,000 last week to 293,000, after contracting sharply two weeks ago. However despite the sharp rise, the level of applications remains near pre-recession levels, indicating that hiring remains strong. Over the past year, the four-week average for applications has fallen 7.1%. The total number of people receiving benefits ticked up by 7,000 to 2.4 million. He number of claims is expected to rise to 299,000. US Non-Farm Employment Change and Unemployment rate: Friday, 12:30. The US economy added 142,000 jobs in August, the lowest figure this year after a 212,000 rise in July. The sharp fall came as a surprise to analysts, expecting a gain of 226,000. However, the unemployment rate declined to 6.1% from 6.2% in the previous month, in line with market forecast. The US had added an average of 212,000 jobs each month over the prior 12 months. While the monthly release was weaker than anticipated, the longer-term trend remains positive. Gains now average 207,000 over the last three months. A gain of 216,000 jobs is expected in the NFP report. US Trade Balance: Friday, 12:30. The U.S. trade deficit narrowed in July to its lowest level since January, reaching to a seasonally adjusted $40.5 billion, from $40.8 billion in June. Exports of automobiles, telecom equipment, industrial machines and semiconductors increased. Imports of oil products increased, but rising domestic production reduced the trade deficit in petroleum to its lowest in more than five years. The decline in trade deficit reinforces views that the US economy continues to strengthen. The U.S. trade deficit is expected to decline further to $41.0 billion in July. US ISM Non-Manufacturing PMI: Friday, 14:00. The U.S. service sector continued to expand in August, reaching 59.6 after gaining 58.7 in July, beating forecast of 57.3. The majority of responders were optimistic regarding business conditions. The business activity index showed a reading of 65, up from July’s reading of 62.4; the new orders index hit 63.8, down from the previous reading of 64.9 and the employment index rose to 57.1, from July’s reading of 56. Overall, the ISM manufacturing and non-manufacturing reports suggest a continued improvement in the U.S. economy. US ISM Non-Manufacturing PMI is forecasted to reach 58.5. We are only a few days from the close of the US Dollar’s best quarterly performance since the third quarter of 2008 – at the height of the financial crisis. Back then, the greenback was charging higher as panicked investors were seeking haven for their capital. Few assets and region’s could offer the level of safety traders were seeking, and the world’s most heavily used reserve currency backed by the largest economy stood as a beacon of shelter. Yet, with the current 11-week rally – the longest on record – circumstances are much different. Volatiltiy levels are close to record lows and investors are still more concerned about yield than they are safety. ‘Fear’ is all consuming and reinforcing, thereby making it a strong fundamental backbone for the currency. Is the dollar’s current drive as enduring? Are there other outlets of strength ready to supplement bulls’ ambitions? To this point, there have been two primary motivators for the Dollar: rate expectations and the relative deterioration of its major counterparts. 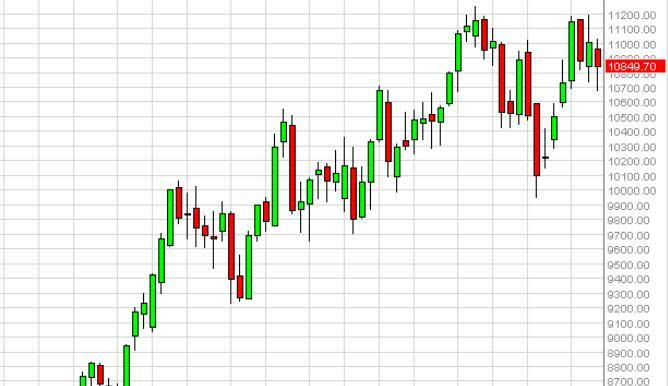 Between the two, exceptional weakness for the Euro, Yen , Australian and New Zealand dollars is responsible for the bulk of the USDollar’s 6.4 percent climb over the past two months. With the Eurozone facing economic headwinds and a increasingly desperate ECB, Japan keeping the course on its open-ended stimulus program, Australia suffering China’s managed economic moderation and the Kiwi reeling from rate expectaitons whiplash; there was a potent appetite for strength and stability. The question moving forward is whether the most liquid counterparts to the dollar will continue to face hardship that redirects capital towards its borders. From an economic standpoint, a downturn in developed and developing world forecasts bolster the robust US outlook. The monetary policy contrast is similarly paced in the Dollar’s favor. While the timing and pace for the FOMC’s return to rate hikes is up for significant debate, even a period of basing would outweigh the active growth in accommodation by the Fed’s three largest counterparts: ECB, BoJ and the PBoC. That said, a considerable discount has been afforded to these imbalances. Further progress requires development of these concerns. Though it may be in second place as market impetus, rate speculation has played a considerable role in the Dollar’s progress. The central bank has just this month reiterated a forecast that a first hike is likely to come in the middle of next year and further upgraded its expectations for the pace of tightening. Yet, on this point, there is room for confidence or doubt to seep in. Where the currency and medium-term Treasury yields (2-year) have advanced, other key market elements have rebuffed the scenario. Fed Funds futures – which are direct hedges to rate forecasts – are showing a dramatic discount to the Fed’s own forecasts. Meanwhile, the ‘low volatility / high risk exposure’ conditions derived from the current glut of stimulus, remain undisturbed. If there is one particular avenue of untapped potential that can most effectively charge the Dollar higher, it is a full-scale risk aversion – the source for the last rally of a comparable magnitude to this quarter. Volatility levels have not rocketed higher outside of the short-term build around scheduled event risk. However, there is a slow and steady build behind these measures. Volume has slowly started to pick up as well while tallies show capital outflows in riskier asset classes. This is an underlying current that will not shift all at once. That said, a sentiment change can carry the dollar much further than the other top fundamental themes. This week, the NFPs is top event risk, but Monday’s PCE inflation figure is just as important a factor in the Fed’s dual mandate – and thereby rate forecasting. If there is one outlet capable enough to unseat global risk trends, it may very well be monetary policy. A key exception comes from final revisions to Q2 Gross Domestic Product growth numbers due Tuesday, but surprises are relatively unlikely and only a big miss would force important GBP volatility. Beyond that, traders will keep an eye on the usual slew of early-month US economic event risk—especially the end-of-week US Nonfarm Payrolls report. With the Scottish Independence Referendum now past, the UK currency can return to basics and trade off of traditional fundamental factors. Credit Suisse Overnight Index Swaps show that the Bank of England will raise benchmark interest rates by approximately 0.50 percentage points in the coming 12 months. This may not seem like much, but it is only second to the US Federal Reserve (and US Dollar) at +0.58%. Last edited by 1Finance; 09-27-2014 at 08:54 AM. The Australian Dollar faced another week of heavy selling pressure as traders likely unwound carry trades amid of a surge in market volatility. Further, a void of major domestic economic data left the currency lacking bullish fundamental cues to catalyze a recovery. The coming week brings a raft of local releases including building approvals, trade balance data and retail sales figures. Yet based on recent RBA rhetoric these are unlikely to materially shift policy expectations. This suggests the potential impact on the Aussie from the figures may be muted. In turn the AUD may be left looking elsewhere for sources of support. Also on the docket will be the release of the official and final HSBC manufacturing figures from Australia’s largest trading partner, China. The upside surprise to last week’s preliminary PMI data failed to leave a lasting positive impact on the currency. This suggests there is a high threshold for Chinese data to generate a rebound for the AUD. The key risk facing the Aussie remains the prospect of a mass exodus from carry trades. A rebound in measures of implied volatility suggests traders are anticipating large swings amongst the major currencies. This detracts from the attractiveness of the Aussie’s comparative yield advantage and leaves it vulnerable to further weakness. 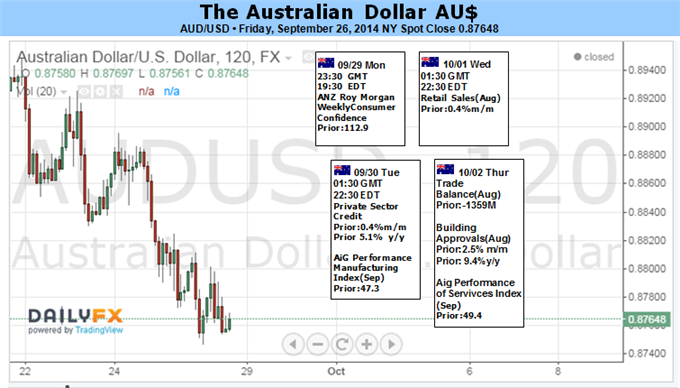 Traders have their sights set on the 2014 lows for AUD/USD near 0.8660. While the magnitude of recent declines may open the door to some profit-taking, this may slow its descent rather than prompt a reversal. Refer to the US Dollar outlook for insights into the USD side of the equation. 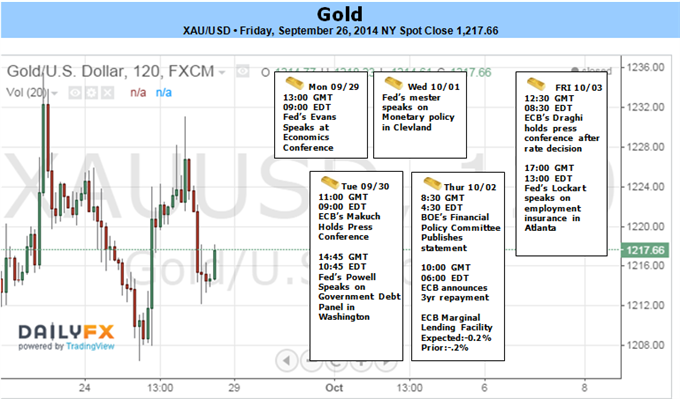 Gold Regains Footing Before US Data, Yet Is There Room For A Recovery? That economic docket picks up considerably next week with the European Central Bank interest rate decision and the US Non-Farm Payroll report highlighting the calendar. Expectations are that the ECB will unveil a massive stimulus package with some estimates calling the European version of QE to top 1Trillion Euros. The US employment report on Friday will central focus next week with consensus estimates looking for a 213K gain in September with the headline unemployment rate holding steady at 6.1%. Should the data disappoint, look for gold to likely remain supported in the near-term as the greenback takes a reprieve with the Dow Jones FXCM Dollar Index posting its 11th consecutive weekly advance this week as prices pushed into fresh 4-year highs. While our broader outlook for gold remains weighted to the downside, we’ll take a more neutral stance as we head into the October open while noting that seven of the last ten years have seen strong performances in gold for the first week of Q4. Of those seven instances, bullion prices saw an average gain of 1.89% and as such, we’ll look to the October opening range for further guidance on our medium-term bias. From a technical perspective gold defended a critical support target this week at $1206- a level defined by the close of the 2013 December 31st candle- which was the low day of the year. A break below this threshold targets support objectives at the 100% Fibonacci extension taken off the 2014 March high at $1193 and the 2013 stretch lows at $1178. Note that the momentum signature is back above the 30-barrier with a topside resistance trigger off the July highs pending. Near-term resistance is eyed at the June lows at $1240/43 with only breach above $1260 shifting the focus back to the long-side of the trade. 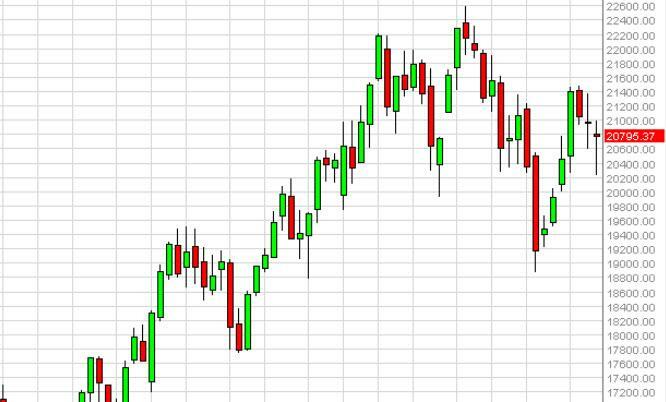 The Nikkei went back and forth during the course of the week as you can see, pressing up against the ¥16,300 level. The fact that we are broken above the ¥16,000 level tells us that we are ready to break out even further, and head towards the ¥20,000 level. We have absolutely no interest whatsoever in shorting this market, and will only buy it. If we fall from here, we will simply look for supportive candles in order to start going long yet again. 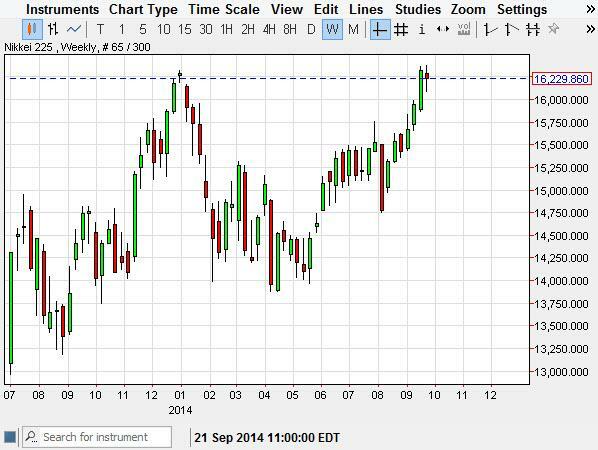 We believe that the Nikkei is heading to ¥20,000 given enough time. 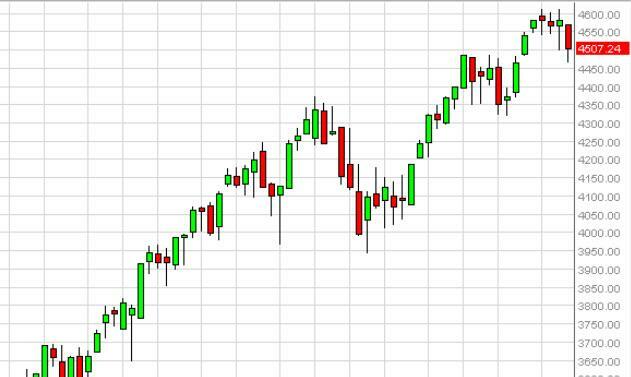 The DAX as you can see fell during the course of the week, testing the €9500 level. The area should be somewhat supportive, but we also believe that the €9400 level below is massively supportive also. So having said that we feel that this is a market that you can only buy, and even if we broke down below there you can see that on the longer-term charts the €9000 level is also supportive. So that being the case, we are simply waiting for some type of supportive candle in order to start buying the DAX again. 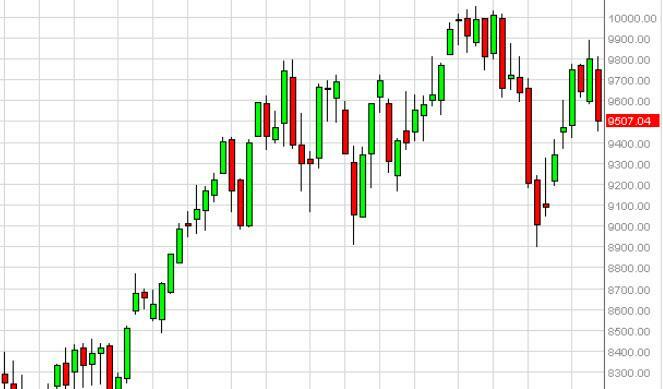 The NASDAQ fell during the bulk of the week as you can see, but found enough support to bounce towards the end. The resulting candle looks as if it has found support near the 4500 level, so we believe that there will be bullish pressure going from here. After all, the market is without a doubt bullish overall, so we have no interest in selling. We are buying supportive candles in this area, or even impulsive candles but believe that the trigger for buying will probably come from shorter-term charts. The Milanese exchange fell during the bulk of the week, but as you can see found enough support near the 20,300 level to turn things back around and form a hammer. This hammer of course suggests that the market is ready to go higher again. With that, we would be buyers on a break above the top of the hammer for the week, expecting this market to eventually head to the 22,400 level. With that being said, we are bullish overall, and believe that the MIB will see an influx of “hot money” again. The IBEX fell initially during the course of the week, but found the €10,700 level to be supportive enough to turn things back around and form a nice-looking hammer. With that being the case, the market looks as if it’s ready to go higher, and a break above the top of the hammer has this market looking for the €11,200 level. The pullbacks on short-term charts will continue to be buying opportunities but we do think that the €11,200 level will be broken to the upside given enough time. Because of this, we are very bullish.